Have you come across with an error: “Unfortunately System UI has stopped”? 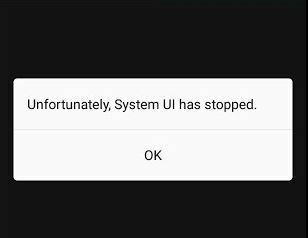 After updating to Marshmallow 6.0 OS version, this error has been reported on many Android Devices. So, if you also facing the same problem, then this article is only for you. There may be various reasons for this error, for ex: Any update, any third party app or any other issue. Let’s check out the best possible solution to fix or solve “‘Unfortunately System UI has stopped” error. There are four solutions on How to solve ‘Unfortunately System UI has stopped’ error. Try this method when you notice that the error occurred on your device just after you’ve updated an app on it. Step 1: First, go to the Setting option on your device. Step 2: Then click the Application Setting (If you are unable to find the Application Setting option then it must be named as Apps on your device). Step 3: Afterward, go to All the apps option, here you will find the Google App button, click it. Step 4: Hit on the Uninstall Updates option. Step 5: Lastly, you simply Restart your phone and check if it has fixed the issue. 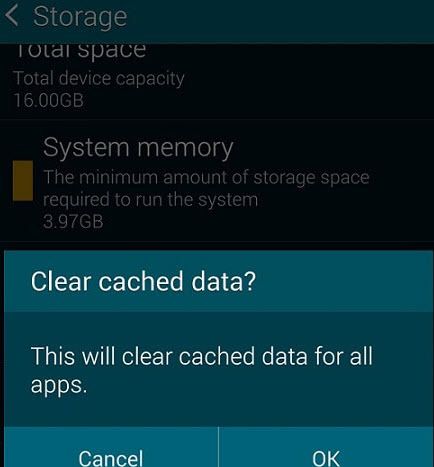 In case your Android device is running 4.2 or above, you can also make use of clear the cache on Android method to fix the Unfortunately system UI has stopped in android issue. Step 2: Then hit the Storage option. Step 3: Choose the Cached Data option from there. As you chose this option, a window will pop up asking for confirmation to clear cache from your device. Step 4: Next, click OK button to confirm that you want to remove the cache of your device. Step 5: Your issue will be fixed. Step 1: First, you have to switch off your mobile. Step 2: After a few seconds switch it on again. Step 3: As soon as your device shows the brand logo while switching on quickly release the Power key and next press and hold the Volume Down button for a few seconds. Step 4: Release the button only when you view the Safe Mode option in the lower left corner of the mobile screen. And it’s done! Before using this process remember your device will seem as if a newly bought mobile because factory reset implies deleting all present data from mobile and restoring the device to its original condition. So, you must make a backup of all your Android data before applying this method. Step 1: Start by going to the Setting option on your device. Step 2: Scroll down and choose the Backup & Reset button. Step 3: Afterward, out of many other options on the screen you can click on the Factory Data Reset option, which is available at last on the list. Step 4: After hitting the Factory Data Reset option, the information will pop up on the screen. Read it and tap on Reset device button. Step 5: Additionally, in case you have a screen lock set on your phone, you will require to enter your pin, pattern, or password to complete the process. Step 6: Lastly, click on the Erase everything option. And you’re done with fixing the issue! 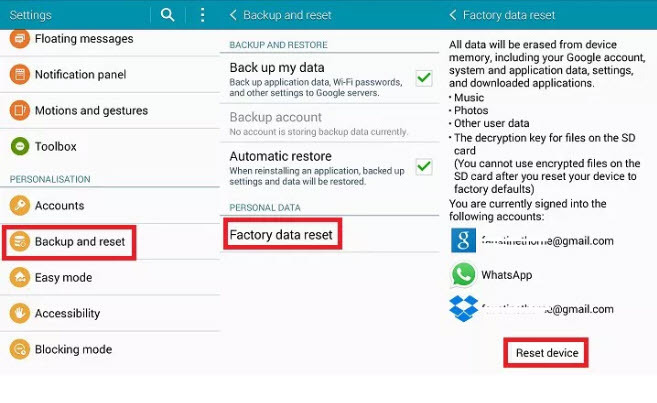 Note: Performing Factory Reset will not have any effect on your SD card data.